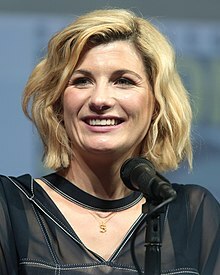 Jodie Auckland Whittaker (born 17 June 1982) is an English actress. She first became known for her 2006 feature movie debut Venus. She received British Independent Film Award and Satellite Award nominations for that role. Whittaker was later praised for her roles in the cult science fiction movie Attack the Block (2011), the Black Mirror episode "The Entire History of You" (2011). She also played grieving mother Beth Latimer in Chris Chibnall's TV series Broadchurch (2013–2017). On 16 July 2017, BBC announced that Whittaker would become the thirteenth (and the first female) incarnation of The Doctor in the British TV series Doctor Who, taking over Peter Capaldi as role of the doctor in the 2017 Christmas special episode ". This page was last changed on 28 January 2019, at 01:35.